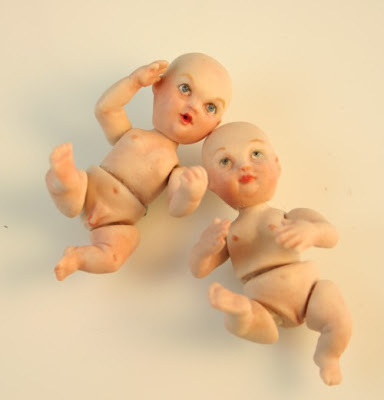 Brad Deville of Deville Doll Designs specially sculpted and created the babies for Michelle and I. His web address is: devilledolldesigns.com Please visit his site and see his wonderful miniature figures as I tell you, with great sorry, Brad passed away. The news is devastating as it reminds us how fragile life is. After overcoming multiple surgeries from an accident and building a new life, he could not overcome a bout with pneumonia. He built his new life on his talents as a sculptor, and quite a fine artist, too! We miss his wit, talent and insight so very, very much. His passing breaks our hearts. He had become a good friend. So goes the song from Easter Parade. What a wonderful movie to sit and enjoy. Here is an exciting idea for using porcelain extra porcelain parts. (Though I have to admit to stage, this figure just as I wanted it I had to manipulate the parts for a custom fit.) I have seen the antique paper dolls that young girls used up their extra fabric and paper bits to dress. A friend of mine has a few framed and hung on her walls. It would a wonderful project to do the same with some of our contemporary paper dolls. The miniature chat group I “play with” is doing a similar project in April. I am going to play along, as it will be a lot of fun. My pretty woman is “Miranda” a Gina Bellous doll mold. It is a 1/12th scale miniature. She is china painted. 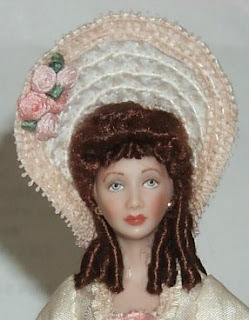 I have secured her to the linen and completed her dress, wig and accessories. I thought this would be quite easy but found aspects of the project a challenge. Working in a small scale is wonderful, but the angles required me to rethink some of my processes. All and all, I like her and think she is very pretty. I hope you like her too and will try something like this in the near future. Purse- This purse was made for a Gene size doll. I have the pattern available. It also comes with a matching hat. 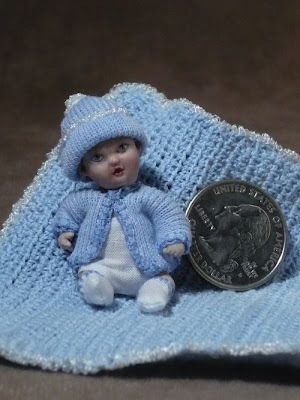 Follow this link to see this and others: Straw Hat Patterns: For miniatures: La Petite Belle, for other than miniature doll size: Evertales. Basket- A great way to accessories your doll. This Basket was made out of hat braid. Kathi made it and then supplied the tutorial.